There has been speculation in recent weeks that Auckland Transport is now favouring a light rail solution over heavy rail, but recently Auckland Transport announced in a joint statement with NZTA that the critical Kirkbride Road intersection for “either light or heavy rail”. Auckland Transport (AT) and the New Zealand Transport Agency (NZTA) have been jointly progressing an integrated transport scheme for SH20A which aims at accessibility improvements to the airport and the surrounding airport business district. The design for Kirkbride Interchange, the first element in this scheme, is well underway. It forms part of the multi modal strategy to help future proof for Airport growth of 14 million to 40 million passengers over the next 30 years. 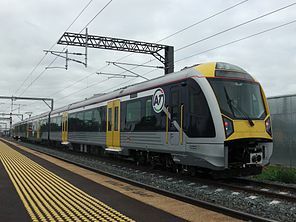 It will future proof a rail connection (either light rail or heavy rail) and also coordinate the works with the Watercare Hunua 4 project in 2015. The decision to future proof for either light rail or heavy rail is to retain flexibility in future to implement either mode should technological advancements in light rail enable potential significant cost savings, without compromising significantly on the overall travel time between the airport and the city centre. While these are being investigated it makes sense that the design of the new Kirkbride Interchange does not preclude either option. The first step – upgrade of SH20A – at a cost of $140 million with future proofing estimated up to an additional $30 million, is due to begin construction in January 2015 and open in April 2017, and will provide a number of benefits once completed. It enables better journey reliability for traffic (and buses) to and from the airport in addition to improved safety for all users through the separation of motorway traffic and local traffic at the Kirkbride intersection. The upgrade will also more fully realise the benefits of the Western Ring Route taking people to and from the Airport through SH20A, SH20 and the Waterview connection due to be completed in early 2017. The multimodal upgrades to this corridor (including the new Kirkbride Road interchange) will support future population and business growth in the area, cater for increasing numbers of travellers, and improve freight efficiency in South Auckland. Other benefits are environmental through improvements to stormwater drainage and treatment, and the reconnection of the community, along with other travel mode choices of walking and cycling. AT’s focus now, is about ensuring the rail mode is protected irrespective of the final choice of rail type and funding yet to be determined.